Getting there: From the park entrance drive north on the park's main road. Turn right at the fork in the road after Lake Theo. Park at the Honey Flat Camping Area restroom. The trail is just to the north of the second road entrance into the camping area. The Hike: The Canyon Rim Trail starts off at the waypoint "Trailhead" on the topo map. Parking for this hike is available at the restroom facilities just south of the actual trailhead. 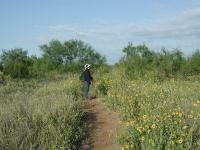 Coppertone pauses on the trail near blooming Sunflowers. 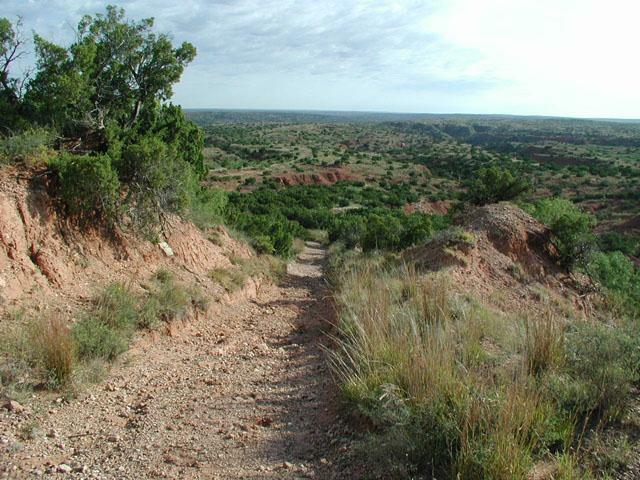 The trail heads east and then northeast, eventually following the western end of the Holmes Creek Canyon. The canyon here is not as dramatic as that on the Upper Canyon Trail, but is scenic nonetheless. We'd see deer later in the hike, but near the trailhead we instead saw a large number of animal prints in the sandy layer on top of the trail. In trying out our tracking skills we identified Deer, Skunk, Road Runner, Raccoon and Coyote. 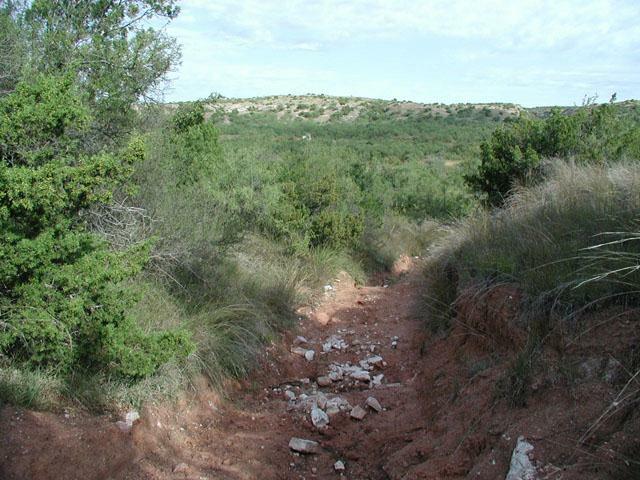 The middle part of the trail is along rocky jeep tracks. There were lots of wildflowers lining the trail along the rim. Since our hike was taken in the fall we could imagine that there is an even better display in spring. A different kind of vegetation was less than welcome however. A plant with stickers on steroids dotted the trail. Unlike the stickers we're used to in the Hillcountry these stickers were larger and MUCH sharper. It was fundamentally impossible to remove them from socks by hand. Two sticks did the trick. Next time we may elect to include needlenose pliers in our backpacks! At some points the trail descends and ascends in rapidly eroding troughs leading down to streambeds. 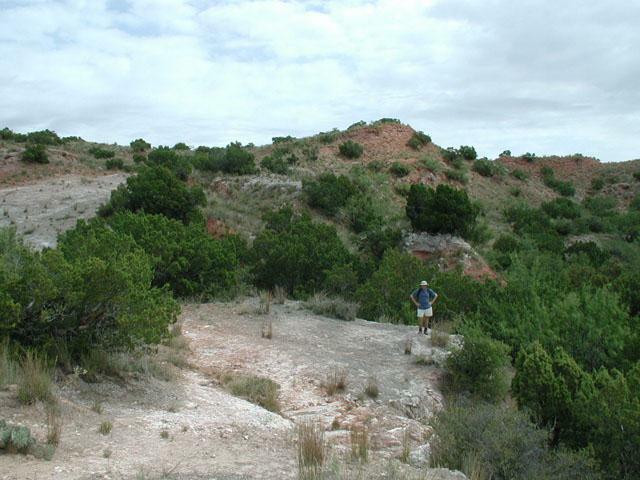 After leaving the canyon rim the trail falls into typical Caprock hiking terrain. Undulating hills and ridges of red claystone bisected by thin layers of white gypsum. The going is not that strenuous but on a clear hot day the lack of any shade for most of the hike could take its toll. Luckily we hiked the trail following the passage of a cold front. The trail descends into the floodplain of the Little Red River. Along this and other sections of the trail the effects of erosion are clearly presented as the trail channels water runoff that cuts deeper and deeper into the hillside. In some places the trail seems to have subsided 5 to 6 feet below where it used to be. Two windmills lie along the trail. A reminder of a ranching past. At the first "Junction" waypoint the hike technically leaves the Canyon Rim Trail as the park defines it. 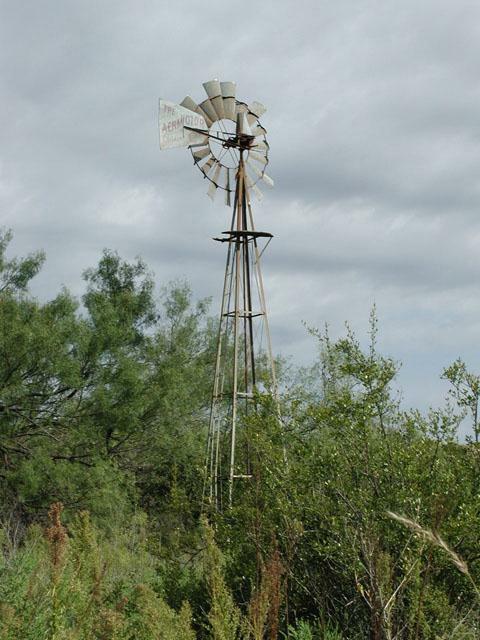 An old Windmill in the area should serve as a landmark. Take a left at this point to continue on an unnammed jeep trail to the next "Junction" waypoint. Here a right turn will lead you to what the park calls the Mesa Trail. The Mesa Trail is aptly named as it quickly ascends up a steep slope. It continues toward the northwest, gaining altitude and topping out on a Mesa upon which it completes a loop at the end. It was on the Mesa Trail that we saw the only other trail users for the entire day. It was a single rider with two Mules. 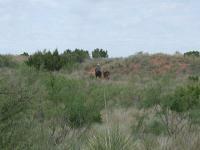 This rider with two mules are the only visitors we saw on the trail. Upon completing the loop at the end of the Mesa Trail one option is to double back towards the trailhead. We elected to map out some additional trails and end our hike at an alternate trailhead that provided a bit more of a direct route back to our car along the park's road. The blue track leading from the main red track is a half mile connector that leads to the Lower Canyon Trail. When it comes into contact with the Lower Canyon Trail take a left and head towards the third waypoint "Junction" on the map. Notice how part of the trail disappeared in the high grass. There were a few spots more overgrown than this. Note that we followed the Lower Canyon Trail to the north for some time before we realized we had made a wrong turn, doubling back at the waypoint "Turnaround". The trail does not end here though as it loops around completely. Austin Explorer poses amongst the brush and rock and ledges along the canyon rim. A four way intersection lies at the third Junction waypoint. Go straight to head towards the "Alt-TH" waypoint and the end of our hike. The trail once again gains altitude and the length of this last segment actually appears to be longer than advertised in the official park map. That may have just been tired legs talking though. The "Alt-TH" waypoint marks the parking area of the Wild Horse Camping Area. From this point we walked along the main park road to the south to get back to our car. We spent about six hours hiking nine miles on the trail and ended up covered more than 10 miles with the trek back to the car. 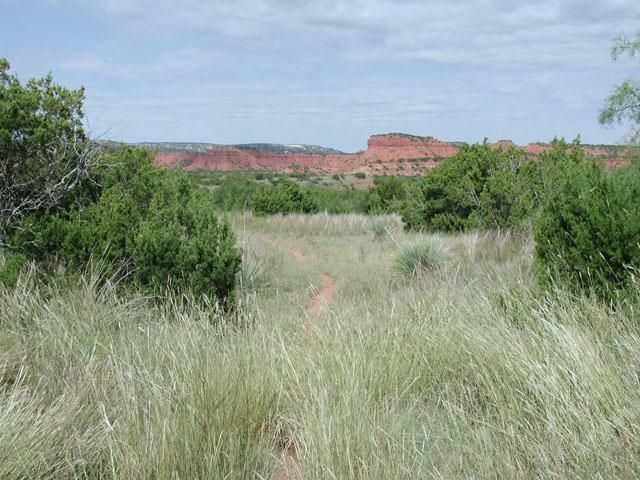 The Rim trail starts out in a grass prairie that runs alongside one of the smaller canyons. The Trail itself is primarily a two track road at the point and fairly easy to hike. There are spectracular views of the Holmes Creek Canyon as the trail winds its way along the rim of the canyon. Look closely as the Bison seem to like this area especially on the nothern end of the prairie just before it descends down into the canyon. After about 1.5 miles the trail cuts down into the canyon. Where it gradually continues down towards the little red river. At about 3 miles total the trail intersects the wild horse trail. I went past this point slightly to the river before turning around and hiking back out the other way.The trip in was fairily easy but the trip back out was fairly strenous especially the last climb back up to the prairie flats. I really like hiking in Caprock Canyons. Its not real crowded and the geological formations of the canyons is very beautiful. This log covers my hike of the Canyon Rim Trail to Mesa Trail to Mesa Spur and then back on Wild Horse Trail. The hike was scenic, especially along the canyon rim, but it was hot (101 degrees F) and I was pestered with lots of burrs/stickers. I do not recommend hiking this trail in short pants and gaiters would be helpful with the burrs/stickers. 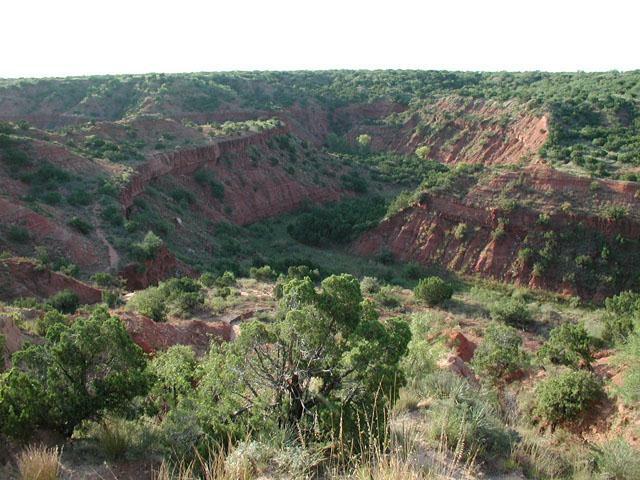 Caprock Canyons State Park is one of the few places you can see bison. There is an area near the trailhead with a lot of prairie dogs, too. The park is also famous for its gypsum crystal deposits. Best to hike this park in the Spring or Fall. It gets very hot in the Summer and cold in the Winter. My wife and I took the nature walk on the first part of this trail just before sundown. I carried our son in a backpack carrier, and he enjoyed it. Trail is easy and well maintained. The park guide was friendly and very informative as to the areas plants and animals that we saw. Short hike,but a chance to get out of the trailer and hike with another family. Good trail, very quiet and peaceful. Lots of good scenery and beautiful red rocks and bluffs. My daughter, our two dogs and I did this hike in October. We saw only 3 other people the entire day. If you have the opportunity to do this hike, go! It is a beautiful hike. The best views on the trail are near the start and along the Mesa Trail loop that lies at the end of the this trail. Much of the trail surface is sandy, which provided lots of animal tracks to examine along the way. We encountered only one other person on the trail, a single rider with two mules. 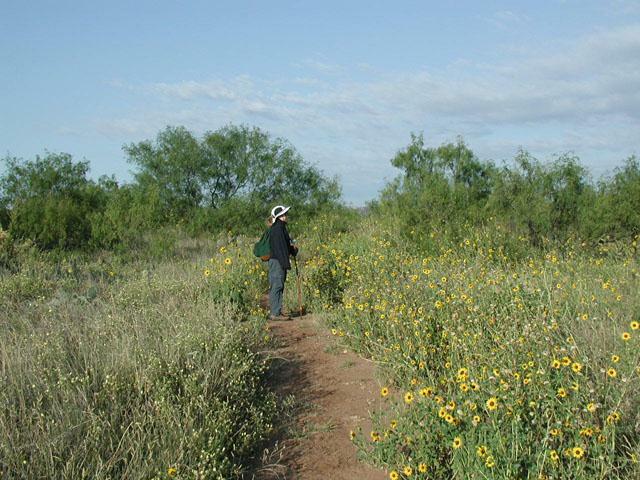 The trail a bit overgrown, so watch out for those panhandle stickers, which are quite painful!